As of 2014, Steven Spielberg's "Survivors of the Shoah Visual History Foundation" has recorded nearly 52,000 interviews in 56 countries and in 32 languages with so-called "Holocaust survivors." The present documentary uses some of them to prove that the orthodox tale about the alleged extermination camp at Treblinka is untenable. It is a Revisionist documentary presenting the latest evidence debunking the greatest hoax in human history: “The Holocaust” – that is to say, the fraudulent claim that six million Jews were murdered by Germans, mostly in “Gas Chambers disguised as Shower Rooms.” Never before seen evidence helps prove that Treblinka was a transit camp, far from the “Pure Extermination Camp” myth currently promoted by the Holocaust religion. For the first time ever, listen to Jews themselves who were transited through Treblinka describe the process of being transferred from Treblinka to other camps, along with hundreds and thousands of other men women and children. Documentation is presented which affirms that Treblinka was no top secret “pure extermination center,” but a simple transit camp where some Jews even took real showers in order to keep them alive. 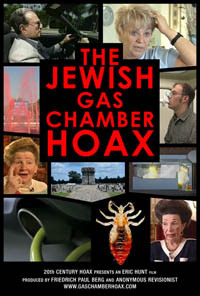 The absurdity of diesel gassings, non-existent mass graves, forced confessions, and more are covered in The Jewish Gas Chamber Hoax, a new documentary from the filmmaker of The Last Days of the Big Lie.